The researchers needed a new theory of physics to explain their results. Physicists have created a device that has experimentally exceeded the conventional second law of thermodynamics. The device is an information engine, which converts information into work, and it is the first such engine to conform to a newly proposed “generalized” second law of thermodynamics. The paper which details this boundary-breaking engine is detailed in the journal Physical Review Letters. Traditionally, the second law of thermodynamics states that total entropy (a measure of disorder) cannot decrease over time in an isolated system where energy and matter can neither come in or out. According to this law, there is a limit to the amount of energy that can be converted into work, because the conversion cannot be 100 percent efficient. But researchers from the Institute for Basic Science in Ulsan, South Korea and the Ulsan National Institute of Science and Technology found a way to surpass this ceiling of efficiency, suggesting that there is still much to be understood about the mysterious relationship between information and thermodynamics. They did this by creating an information engine, which is sometimes called “Maxwell’s demon,” using a particle trapped by light at room temperature. Because of randomly fluctuating heat, the particle moves slightly, its motions tracked by a photodiode. If the particle moves significantly in a specified direction, the light trap moves in the direction of the particle, following it. 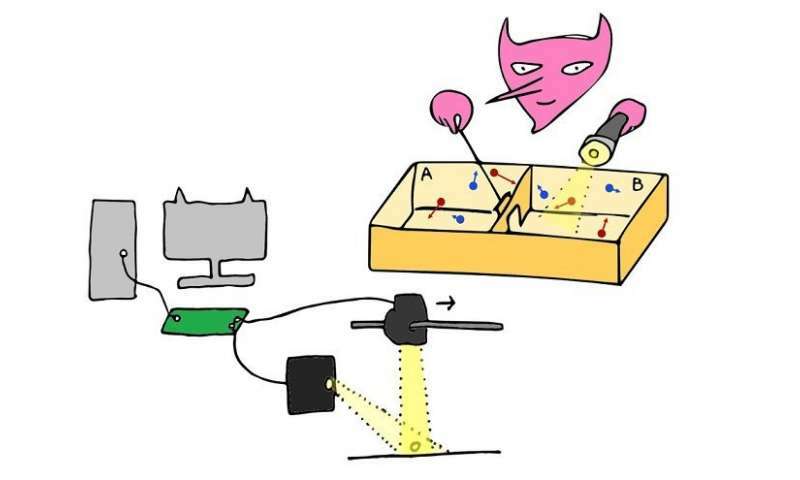 An artist’s interpretation of the experiment featuring “Maxwell’s demon.” Image Credit: Govind Paneru and coauthors. After many repetitions over time, this information engine can transport the particle in the specified direction just by extracting work from the information gleaned from the random thermal changes. In this system, there is no free energy component, so that does not have an effect. The results of this “demon” device supported the possibility of a lossless engine, in which virtually all of the available information is converted into work. This represents a new frontier in thermodynamics. Not only did this experimental device surpass conventional thermodynamics, it also raised the question of whether the efficiency with which information can be converted into work is actually limited at all. So, to explore this potential and why this information engine crossed such boundaries, the physicists turned to the newly theorized generalized second law of thermodynamics. While the conventional law constrains the work “created” in an information engine only by the difference between the beginning and final free energy states, the generalized law adds a second constraint — the amount of available information. This second component extends the boundary initially created by the conventional law, allowing for a system to be more effective through the extra work that can be extracted from information. The new theory predicted the results of the experiment almost perfectly, with the information engine achieving about 98.5 percent of the highest efficiency allowed by the generalized second law. So far, this study proves only that you can push the limitations of conventional thermodynamics (still, a significant and extraordinary feat). But, while this could lead to future boundary-pushing research and allow physicists to better understand the relationship between information and thermodynamics, Pak told Phys.org that there are potential applications “to create hybrids of biological systems and engineered ones, even in the living cell,” using nanotechnology.